Your essential guide to the modern wedding! Is it acceptable to invite my boss to my wedding? Can I tell my guests not to post pictures of my wedding online before I can? How do I ask my in-laws to help with wedding costs? How long do I have to write thank-you notes? Every bride has her own etiquette dilemma, from dealing with unhappy stepfamilies to a guest who posts a picture of the invitation on Facebook, advertising the wedding date and site to hundreds of nonguests. While some etiquette rules stay the same (bringing an uninvited guest is still rude), the ever-changing modern world has brought on a new slew of challenges. 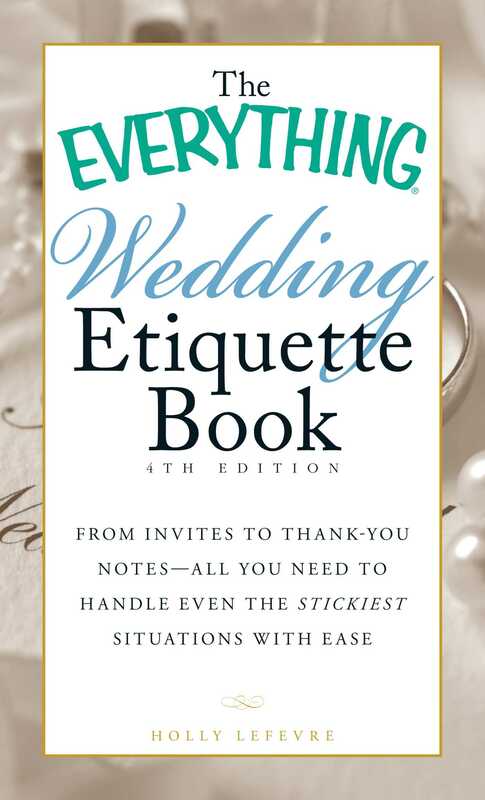 Luckily, The Everything Wedding Etiquette Book, 4th Edition has the advice you need to conquer any etiquette predicament. From satisfying future in-laws to controlling your event's online presence, you'll learn how to handle every situation with grace and ease. Organized to guide you through the wedding-planning process as it happens, this little book has all the answers you need right when you need them. It's your one source for planning a perfect, stress-free wedding.